While large-scale focal points such as video walls seem to be taking a turn toward more personalized experiences, there is still a place for video wall systems. But exactly where is video wall technology headed, and how can those utilitizing the technology get the biggest bang for their buck? First, let’s talk video wall technology. Flat panel displays have moved aside to allow LED tiles to take over. However, for many clients desiring a video wall, the LED technology is often too expensive, given the pixel pitch required for best visual acuity, and the video wall itself ends up serving little purpose beyond high price-tag artwork. Video walls should have a purpose beyond that, and paying $200K or more for artwork can be hard to justify. Thus, there needs to be more cases for a video wall’s usage. For instance, sometimes a projection system just isn’t in the cards for the client, so in order to achieve optimal viewing, a video wall may need to be considered. This type of application lends itself to conference centers or medium to large seminar rooms. Sometimes the light levels are too bright and oftentimes cannot be controlled if the client does not want shades or dimming. Other times the architecture simply does not allow for a projection system unless placed in the back of the room, in which case the projector needs to be very bright and have a long lens, which increases price. This is when a video wall may also want to be considered. Another primary case for video wall usage still in play today is the lobby or welcome area. We all want that “wow” factor when guests enter the lobby and a video wall is a great way to achieve that. However, this again runs the risk of high price-tagged artwork if not utilized properly. 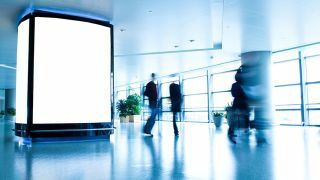 Maximizing the use of a lobby video wall may include its multi-functionality. Perhaps the lobby can also be used for gathering events or parties, in which case the video wall can be used to stream content or allow someone to present information. Designing the video to show signage, artwork, and auxiliary content in a timed sequence is another great way to maximize the use of the wall. When designing these types of walls, the back end of the system becomes very important. This is where video-over-IP solutions can really maximize flexibility, while keeping cost and space requirements down. I often find clients leaning in favor of multipurpose video wall designs that also allow them to use the space in various ways, including parties, TED Talks, a pre-function gathering, or even as a customer experience space. Remember, it’s not just about allowing the video wall to show multiple types of content, as they have always been able to do that. Rather, it is more so about using the video wall to help transform the actual experience of the space with variety. This ultimately will yield a larger return on the investment and help the client feel more comfortable putting large chunks of money into a single technology system. As long as the approach to designing it is experience focused and on transforming the space for multiple uses. Otherwise, that video wall may not be worth the cost when compared to a smaller personal approach to welcome area content.